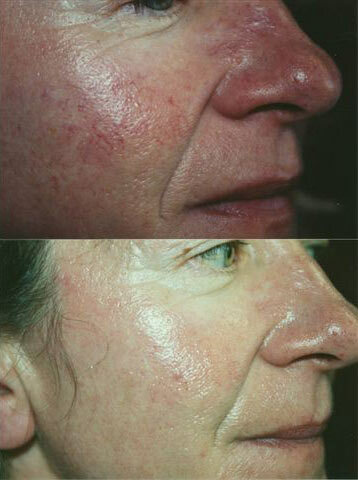 Clear your acne blemishes with easy pulsed light treatments. Acne occurs when the pores become clogged with dead skin cells and excess sebum. This provides an ideal medium for bacteria to multiply – causing pimples and inflammation. Acne generally begins in puberty but can last well into adulthood. Pulses of filtered light are directed into the skin, where they destroy bacteria to clear current acne breakouts. The light pulses also slow down the production of sebum, which can get clogged in the pores – this prevents future acne breakouts. Pulsed light systems are similiar to lasers but with a larger light beam than most lasers for wider coverage and faster, more comfortable treatments. 1. It attacks bacteria to clear current acne breakouts. 2. It decreases the production of sebum, which clogs pores and traps bacteria, leading to future acne breakouts. Your skin may be slightly red after treatment. 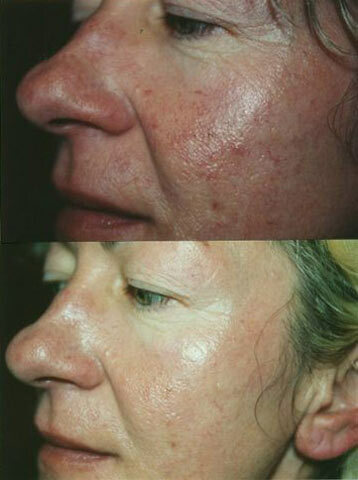 The acne blemishes shrink and become less noticeable, and then fade after approximately one week.